In this post, I postulated that skin drag amounts to about 80% of drag and simply divided the skin drag by 0.8 to obtain the total drag. where and are the half angles (in degree) of the bow and stern, respectively. Tuck and Lazauskas do a complete modeling of wave drag as well, and come up with something that we could almost call a phase diagram for rowing shells. Looking at the figure 2b here, the wave drag is around 6% of total drag for shells optimized for racing speed, a Froude number around 2 in the figure. Of course, wave drag varies quite strongly with the shell’s velocity. However, the shell velocity varies during the stroke, and it seems a good approximation to use an average value for wave drag which is only a minor portion of the total drag. Doing the integrals to calculate the instantaneous value would slow down the simulation software too much, for a relatively small improvement in accuracy. As far as the bow and stern angles are concerned, I collected data from boat manufacturers sites about the boat length, beam and draft as a function of the displacement.The results are depicted in figure 1. The solid line is a linear fit, showing that all boats are basically of (more or less) the same shape. Assuming a parabolic boat shape, the bow half angle would be 8 degrees, with an elliptic shape around 6.3 degrees. This would give a value of between 0.12 and 0.15. So, the total drag (wave drag, skin drag and form drag) would be about 1.2 to 1.22 times the skin drag. Or, in other words, skin drag accounts for about 82% of the total drag. 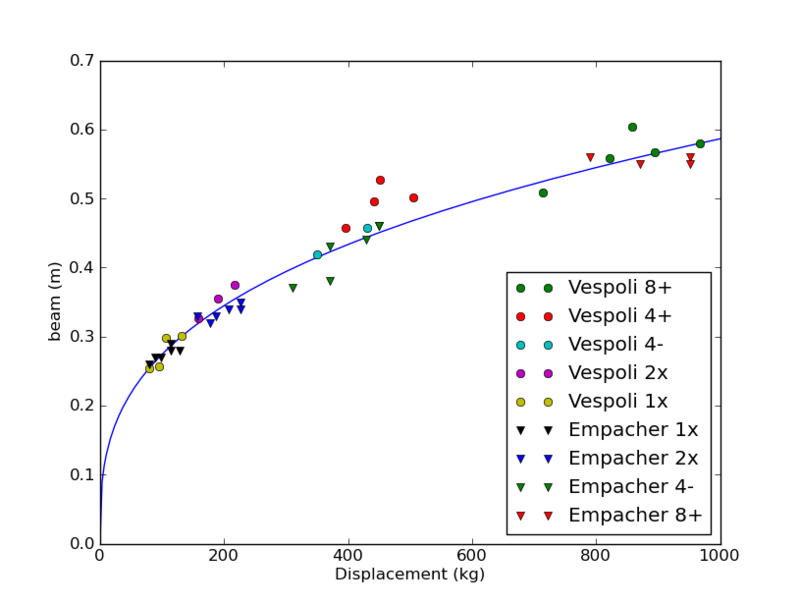 Regarding the scaling equation used for different boat types, it is clear that if all boats are basically scaled versions of the same shape, then beam, draft and length should be proportional to the 1/3 power of displacement. This is clearly shown in figures 2 and 3. 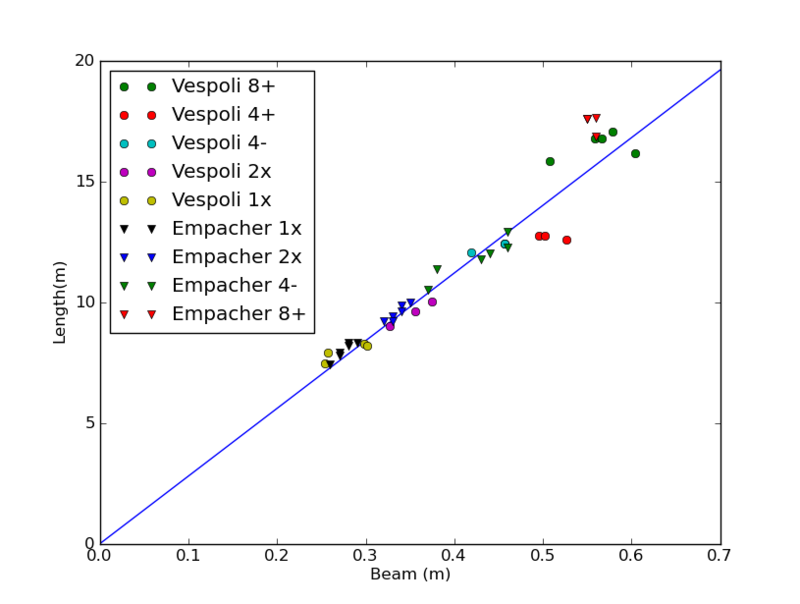 Figure 2: Beam as a function of displacement for different makes and types of shell. 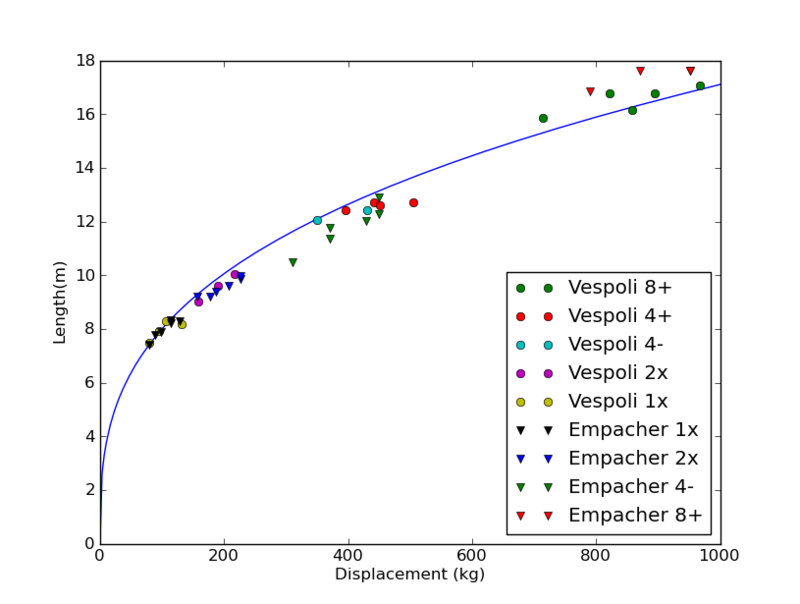 Finally, figure 4 shows the wetted area as quoted on various manufacturer’s websites as a function of the displacement. The solid line shows the scaling that I use in my model. So, in conclusion, the mystery isn’t a mystery any more. 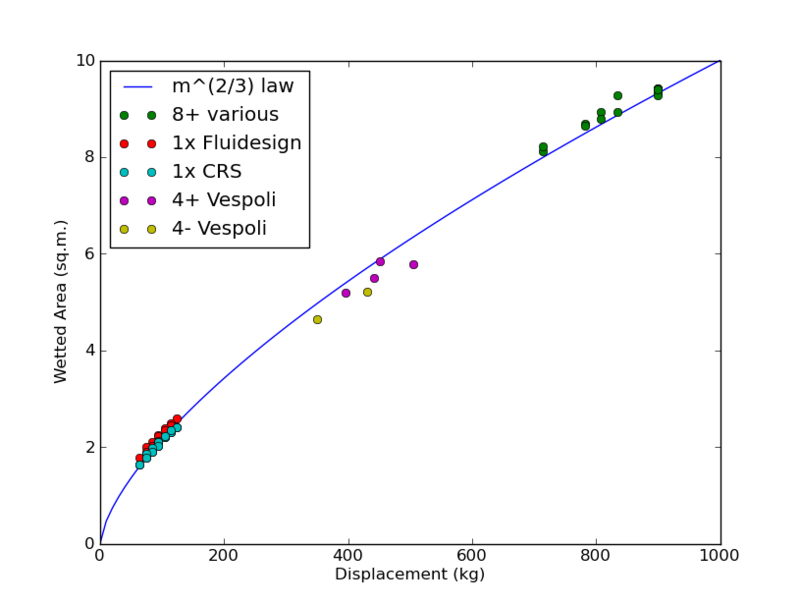 The lower value quoted by Slasias and Tullis is just the skin drag portion calculated from a 5m² wetted area. In reality, the wetted area of a four is slightly higher, and one has to add 20% for wave drag and form drag. Looking at the scatter of the data in the various graphs, I would also say that the accuracy of my model is good within about 10%, not better. This is not a disaster, as the relative results predicted by the model are still valid. Finally, boat design is found to be extremely important, as a 5% reduction of skin drag can means a mean velocity increase of 2.6%. This amounts to more than 2 seconds per 500m for an eight. This entry was posted in rowing physics on November 21, 2010 by sanderroosendaal. You are to be congratulated for your skill in obtaining boat data from manufacturers! I has no success whatever in my attempts to find information- in addition to the readily available hard boat dimensions- on such things as the water-level beam (BWL, in Scragg), length (LWL) and seated displacements (D). And, as a result, my guesses for block and prismatic coefficients for boats smaller than the eights of Scragg are problematic. Boat makers, it seemed, were not even able (or willing?) to give me estimates of the resistance factors (k=R/v^2)for any of their hulls. Keep up the good work- I am interested in the rower “internal” work problem. I’m James from Australia. Your note on hull/wave drag was an interesting take. May I ask in a very considered and respectful manner; When go through the process of modelling – in this case – on the Rowing System, is it just for you own curiousity as this is what you enjoy, or do you have a vested intersted in creating models that in some way will help the rowing Community as a whole? The reason I ask is that I was directed to a single set of comprehensive data on a shell produced by Vespoli. And ‘back in the day’ when I was getting my head around the Rowing System, this was an excellent starting point and illustraited ( short of sending the CAD file…) all of the mathmatical values and/or citations of the shell. Rather than starting a game of Ping Pong, if you like, I’m happy to contact Vespolli to make sure the info they gave me is Public Domain. And if it is I can post it on this thread. The thing I really like about this data set is that it sets out what needs to be included in any modelling Set to reflect the characteristics of the shell. One point I will let you in on. You assumed that the center of the boat below the LWL was of a parabolic shape. Of course we know that if a hull was designed with most of the wetted surface area taking the form of a semi-circle if it was sliced up on the X-axis long, we wuold achieved the max amount of water displacement relative to the wetted surface area. About 10 years ago ‘they’ ( I forget ) actually built a boat of this design. However, it was a total failure as the crew could not balance the boat. Hence today shells in their mid section have more of a ‘U’ shape; a flat bottom. The Empacker design has remained unchanged and is the boat of choice at the elite level. But only in the last 5 years are Empacher having some serious competition, primarily by Fillipi, Hudson with their Hammerhead and Sykes, specifically in the 2- & 2x. The latest release is the M33 Shell. They may have some info on their site about it. This shell is the next generation from the Shell used by the Austrailian Pair of Ginn & Free in 08. All designed by Lazauskas and Dingle. First of all, let me comment on this: “… showing that all boats are basically of (more or less) the same shape”. Of course, when you look at the scatter of the data, you can see that this is not true. Also, looking around at races, you can see differences between boats of different makes. What I wanted to express is that for my model, where I don’t know the exact shape of the boat, I can take the displacement and get (in good approximation) the wetted area. Of course, in hull design, small optimizations can make a big difference. A 5% improvement can make a difference of 5 seconds in a 2km race. The parabolic shape I talked about is the shape of the waterline looking from the top. I should have expressed myself more clearly. Regarding your very first question, I am doing this mainly for my own enjoyment. Of course, I would be happy if it could help the rowing community in some way, but to be honest I think I haven’t brought rowing science a bit further. I would be happy if this site would be considered as a nice summary of rowing physics. No dramas. Anything that Laz or Kleshev has released is very good. I can only call these two guys as Laz is the mind of Australia & Kleshev only left us about 5 years ago. It’s an enormous task to capture accurate data sets so it doesn’t happen often. But we’ve had a good run in recent years, and the new lads are are on the improve. I’ll call it now! Josh Dunkley-Smith is the most talented oarsman I have seen since Drew. A beautiful long style and rhythm and his erg is off the charts. I just had a look at the Vespoli foci and it is now public domain. Shoot me your email to Jamessylphide@gmail.com and I will OCR it and send it to you. Enter the world of metacentric co-efficients and the like! good job for you ! What good Job is is it that you thnk I have ?! hello sander. i’m Danilo Barasso on lake of Varese. Are you looking for ouar house?